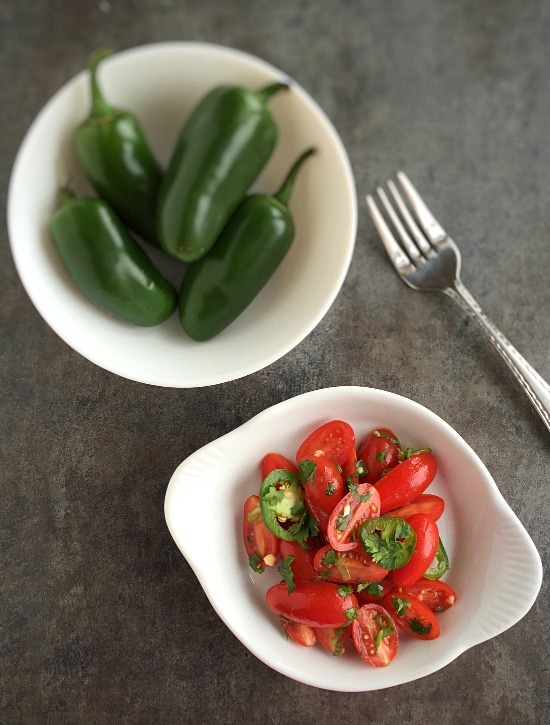 This spicy tomato dish is an adapted version of a recipe in the Cooking Light – Cooking Through the Seasons cookbook. The beautiful cover caught my eye when I was searching the shelves at the library. I’m a very visual person, so a cookbook NEEDS to have pictures, and this one has lots of them. How do you feel about cookbooks without pictures? Must-have or doesn’t really matter? Let me know in the comments below. These Spicy Marinated Tomatoes get more delicious the longer they are in the marinade. You’ll want to make this at least an hour ahead of serving to let the tomatoes absorb the flavors of the marinade. Four or five hours is better though. I made them in the early afternoon, and served them at dinnertime. This recipe can be made up to two days in advance. The tomatoes will give off some liquid as they marinate. The little bit of sweetness from the coconut sugar gives a nice balance to the acidity of the white balsamic vinegar and tomatoes. Speaking of which, if you’ve never tried white balsamic vinegar before, this is a great introduction to it. It’s taste so clean and crisp; totally different from the regular balsamic. You can substitute cherry tomatoes if they happen to look better at the store that day. Trader Joe’s sells 16 oz. 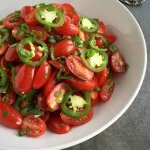 containers of organic grape tomatoes, which is what you need for this recipe. In a small bowl, whisk together the vinegar, olive oil, coconut sugar and sea salt until sugar and salt have dissolved. Alternatively, you could place these ingredients into a small jar and shake until combined. 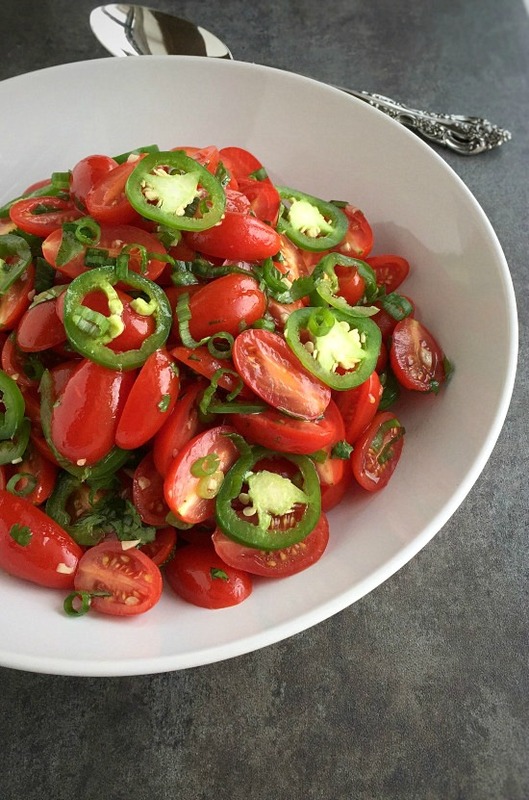 In a large bowl, place the tomatoes, jalapeno, scallions, cilantro and garlic. Pour the marinade over the tomatoes and toss to combine. Cover and refrigerate for at least one hour before serving. Bring back to room temp before serving. Can be made up to two days in advance. Disclosure: Posts contains an affiliate link. If you purchase a product through an affiliate link, your costs will remain the same, but I earn a small commission. This helps to cover the costs of this site. Thanks for your support! By Tempie at September 21, 2017 .